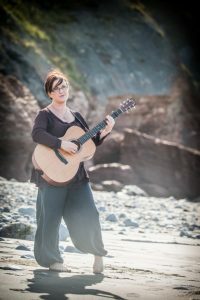 Her rapid rise in the folk world began when her 2013 debut folk album Bare Foot Folk was played on BBC Radio 2 and gained the attention of veteran folk broadcaster Mike Harding, her 2014 album The Lament of The Black Sheep subsequently received 5-stars from The Telegraph which led to Arts Council England funding her 2015 album Esteesee – an album of music based on the life and work of Samuel Taylor Coleridge. During the 4 years Ange Hardy has been on the scene she has been joined by folk legends that span the generations of the folk revival, with artists including Nic Jones (Penguin Eggs) and Luke Jackson (Fumes & Faith) joining her to sing her songs on stage, and Steve Knightley (Show of Hands), Kathryn Roberts (BBC Radio 2 Duo of the Year), Nancy Kerr (BBC Radio 2 Folk Singer of the Year) and James Findlay (BBC Radio 2 Young Folk Award Winner) amongst those adding vocal contributions to Ange’s albums. Between recording albums Ange has always found time to write and release a Christmas single every year. She is currently writing new material (as she always is! ).